Born in his mother’s home town of New Haven Connecticut, Hogan moved with his family to Mt. Holly when he was four. Musical even as a child, he would walk around singing “Tootie Fruity” by Little Richard, so folks started calling him “Tootie”…although he says there is at least one alternative story about how he got his name. Either way, the nickname “Tootie” stuck. At the relatively tender age of sixteen Hogan, or Tootie, was already playing out with various bands in Charlotte nightclubs. One evening while playing with a band called Heat in a club called Soul 21 on Statesville Road, in walked members of Bill Pinkney’s original Drifters. After hearing him play, and lacking a lead guitar player, Hogan was quickly recruited to fill the vacant spot. So in 1972, Hogan left high school, his family, and Mt. Holly, to go on the road full time with the Drifters. By the mid 90’s, life on the road began to lose its appeal. Hogan wanted to spend more time with family, including two children. So although he continued to tour occasionally, and as recently as 2009 with the Tams, Hogan decided to focus on his own music for a change. He subsequently released several albums; in 1995 wasDreaming At Midday, 1998 saw the release of Last Flight OUt, and 2009 brought Final Destination. Currently, a cut called Picnic In The Park is available as an Amazon single. These days Hogan lives quietly near his parents in Mt. Holly, teaching, playing various gigs-festivals, wedding, private parties, doing session work and corporate events. As a solo guitarist, but not a singer, he primarily is primarily a jazz player, with occasional ventures into the beach music or hip-hop world. He does not wish to be back on the road as part of a band, he wants to be the front man. Says Hogan, “I feel like I have paid my dues, all those years on the road.” Today he plays solo occasionally, but prefers to play with four guys he has known a long time. James Tootie Hogan has always listened to his own tune. 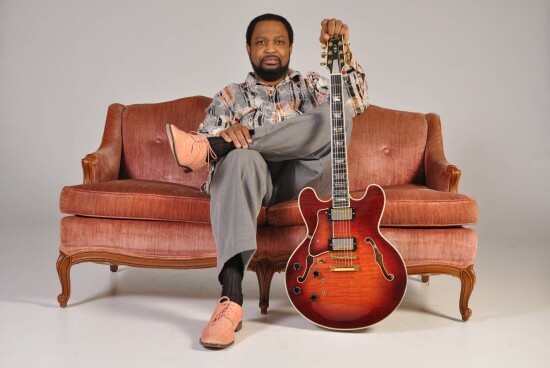 “A lot of times I would play what I wanted to play, instead of what was written, and they would say-“play it your way, we like what you are playing better” Did I mention that Tootie –who is left handed- learned to play a regular right handed- guitar, but realized his reach was limited, so he re-learned to play on a true left handed guitar, “didn’t take me long he said.”(Imagine relearning to type or keyboard, but backwards from the way you do it now). Always one to defy convention, he still plays a right handed bass. Left handed of course.